Joe Philbin, fired as head coach of the Dolphins, was the Packers' offensive coordinator from 2007-2011. 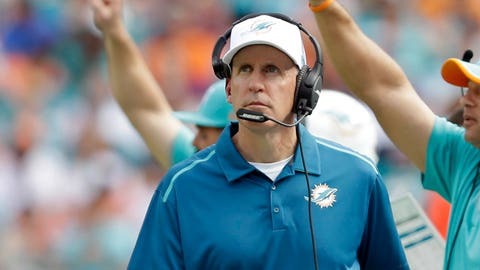 MIAMI — Joe Philbin was fired Monday four games into his fourth season as coach of the Miami Dolphins, and one day after a flop on an international stage that helped to seal his fate. Tight ends coach Dan Campbell, who has been with the Dolphins since 2010, was promoted to interim coach. He has no previous head coaching experience. "I’m not here just to finish the season up," Campbell said. "That’s not my plan. We’re coming here to win games. It’s still early. We have time to turn everything around. But we can’t wait." The Dolphins (1-3) lost their third game in a row and turned in their fourth consecutive lackluster performance when they were beaten Sunday in London by the archrival New York Jets, 27-14. Midseason head coaching changes are unusual in the NFL, but few will accuse owner Stephen Ross of impatience. He ignored calls to fire Philbin in December after the Dolphins faded to finish 8-8 for a second successive season. But doubts only grew this season regarding Philbin’s inability to motivate players with his bland demeanor. Campbell said he respected Philbin but plans to make practices more intense. "This is my sixth season with the Miami Dolphins, and this is the most talented roster we have had in those six years," Campbell said. "We have plenty of talent. "I feel there’s a lot more we can get out of these guys. We need to change the culture to where it is so competitive on Wednesday, Thursday, maybe even Friday, that it’s intense and heated. We may have to break up a few (fights) — that’s when things get good. You can’t go through the motions Wednesday and Thursday and turn it up on Sunday. It doesn’t work that way." Ross said the decision to fire Philbin was difficult. "I don’t believe we were performing at the potential we have," he said. "I felt this was the time to make this decision. I haven’t seen a lot of improvement. I see the same old, same old. "My goal is still to make the playoffs. I felt this was the best opportunity we have — to pick Dan Campbell as our head coach." The Dolphins have started poorly in every game and have been outscored 37-3 in the first quarter. The offensive line has been a problem throughout Philbin’s tenure, and the defense has progressively gotten worse under coordinator Kevin Coyle. They rank last in the AFC in rushing and offensive points per game, and last in the NFL in sacks and run defense. Philbin, who was hired as a first-time head coach in 2012, went 24-28. He failed to reach the playoffs or even finish above .500. Philbin, who said after Sunday’s loss that he wasn’t worried about his job security, issued a statement after being fired. "I want to thank Steve Ross for allowing me the privilege to serve as the head coach of the Miami Dolphins," Philbin said. "This is a tremendous organization from top to bottom that has a talented and dedicated staff. I want to especially thank the players, coaches and football staff who have worked so unselfishly and represented the team with dignity and class. I would be remiss if I didn’t thank the incredible fan base who has supported me and my family unconditionally since day one. "It is my hope that the 2015 Miami Dolphins achieve great success both on and off the field." Philbin’s job has been in jeopardy since a rocky 2013 season that included a bullying scandal and a meltdown in the final two games that cost Miami a playoff berth. The Dolphins have floundered for more than a decade while going through frequent shake-ups at the top. The next coach will be their eighth since 2004, and the second hired by Ross. The Dolphins are on course to miss the playoffs for the 13th time in the past 14 years, and the seventh season in a row. It has been 23 years since they reached the AFC championship game, 31 years since they played in the Super Bowl and 42 years since they won an NFL title.